Schneider Regional Medical Center’s infrastructure still bears evident scars from the 2017 hurricanes, but it is functioning and providing quality healthcare, Vice President of Facilities Management Darryl Smalls told the Source on Thursday. According to Wheatley, the hospital remains in compliance with the strict conditions of participation of the Centers for Medicare and Medicaid Services, the federal regulatory body that evaluates hospitals nationwide based on a set of criteria spanning everything from life safety to environment of care. Based on these criteria, CMS determines whether a hospital gets reimbursed for services that qualify under the Medicare or Medicaid programs. 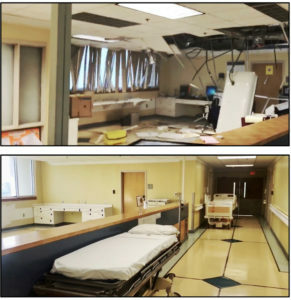 Left: The SRMC roof being repaired on Sep. 4, 2017; Right: SRMC roof, July 2018. “We basically have a commitment to our employees and our patients that we have to have an infrastructure that’s intact, that meets the life safety and environment of care standards of regulatory bodies, the joint commission and CMS,” said Wheatley. Smalls admitted that much work still needs to be done, including fixing the compromised roof over the operating rooms and labor and delivery, which sustained punctures in many places during the hurricanes. According to Smalls, on Sept. 24, work began on resurfacing and sealing the roof that now looks completely unrecognizable from the torn, pockmarked surface immediately after the hurricanes. The rooftop air conditioning unit servicing critical areas of the hospital, which exploded during the storms, was replaced with a newly purchased unit. Other rooftop equipment still needs to either be repaired or replaced, according to Smalls. The adult medical unit on the fourth floor bore the brunt of Hurricane Irma, with exterior windows blown in and water infiltrating the units. Hospital staff ended up transferring patients to the labor and delivery unit before eventually placing them in the adult surgical unit in an opposite fourth-floor wing, according to Chief Nursing Officer Darice Plaskett. Ten months later, the adult medical wing’s ceiling has been refurbished, new lights installed and a new window system put in place. Maintenance staff have also begun repopulating the rooms with hospital beds and furniture, Smalls said. Smalls said it might take another couple of weeks to get the fourth floor’s medical unit operational again, and only when staff becomes available. Even then, the unit would not see the original number of beds. According to Smalls, a functioning adult medical unit would bring back only about 24 beds, mainly due to the hospital’s severe shortage of nurses. With the anticipated arrival of new nurses drawn by the recent $12,000 hike in nursing salaries, more beds would become available on the fourth floor, said Smalls. Schneider Hospital’s VP of Facilities Darryl Smalls stands inside the largely abandoned administrative area on the hospital’s second floor. The second floor is testament to the cash-strapped hospital’s effort of focusing repairs on patient care areas. Much of the ceiling in the second-floor hallways is a continuous gaping hole, with cables hanging exposed over bags of debris laid in organized piles on the floor. Instead of diverting intensive repair efforts to the administrative offices, Smalls said they chose to relocate administrative divisions to functioning wings. As part of the physical plant shuffle, the hospital moved the medical records office and human resources to the fourth floor, the business office to the fifth floor, and the executive offices to the other end of the second floor that remains functional. The computer systems, however, remain on the second floor because the computer servers cannot be relocated, according to Smalls. “Because we’re starting to resume a lot of what we were doing before, we’re looking at a small portion of the [second floor] that was impacted and looking at the feasibility of doing some repairs to be able to accommodate some non-patient care activities,” said Smalls. The Charlotte Kimmelman Cancer Center remains out of commission, with furniture strewn across the facility and the floors covered in dust and debris. Sheets of peeled paint hang from several areas of the ceiling where water pushed through, and the air remains faintly stale. The air handlers on the cancer center’s rooftop, which act as giant blowers circulating the air, were undamaged by the hurricanes, but the brand-new chiller units purchased before the storms have yet to be installed. The radiation treatment area also shows signs of water infiltration but much of the unit seems intact. 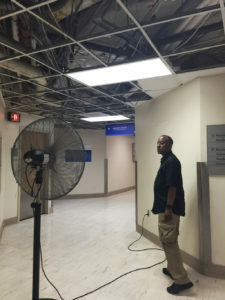 According to Smalls, the hospital is considering repairing this area only to resume radiation services but not before repairing the exterior walls, fixing the damaged areas of the ceiling and turning on the air-conditioning. Two of the cancer center’s major pieces of equipment – the linear accelerator and the CAT scan – also remain housed in the cancer center and are still operable, said Smalls, according to their manufacturers’ technicians. Some 10 modular units are currently sitting on the parking lot of Myrah Keating Smith, SRMC’s St. John facility. The modulars were slated for physical completion in August, according to Wheatley, but Smalls said that target date has been pushed back to September. Some data and installation equipment still need to be put in place, said Smalls, and additional exterior work still need to be addressed beginning next week. When the physical components are in place, regulatory entities, including CMS, will need to inspect the units before Myrah Keating can perform any type of patient care activities in the facility. The modular units will house the emergency room, examination room and observation room housed in the original structure. Wheatley, however, stressed that the new temporary structures are significantly smaller than the damaged facility, which sprawled 28,000 feet. The modular units, in total, occupy only 2,500 feet. Compared with Myrah Keating, the temporary structures for Schneider Hospital on St. Thomas trail further behind. The hospital remains in phase one – scheduled to be completed in October – during which the hospital is fully engaged with its architectural and engineering firms, said Smalls, as well as tapping its staff to develop a program for the types of services to be offered in the modular units. Requests for proposals to design, deliver and build the structures then follow in phase two. Just like Myrah Keating, Schneider Hospital is looking at a greatly reduced operating space in the proposed modulars. The modular units, however, serve as a stop-gap, a costly, time-hogging but unavoidable Band-Aid to the hospital’s myriad infrastructure woes infinitely complicated by the 2017 storms. The big question for hospital executives is whether to repair the extensive physical plant damage or to build a completely new structure. That decision hinges on the cost assessment by the Federal Emergency Management Agency, according to Wheatley. 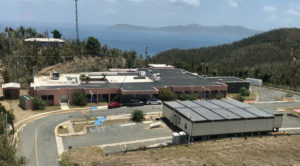 “If it meets the 50 percent FEMA rule in terms of the cost to repair the building versus the total cost of replacing the building, a decision will be made whether the building continues as is or a new structure will be built,” Wheatley said. While partial assessment has been completed, as of Aug. 2, FEMA has not yet released the final assessment on the cost of repairs. Wheatley said there has been discussion of building from within the actual hospital facility in phases, or actually building a whole new structure in another location. Vice President of facilities is a made up position in order to pay Mr Smalls more money. It’s a total scam. A small hospital like this should only have a director of facility but in order to pay him more money they give him a fancy title.